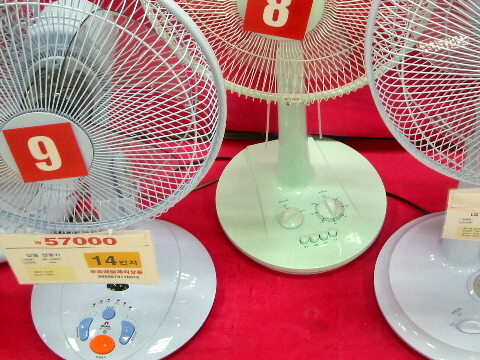 English: Close up of fans being sold in a South Korean department store in June 2003. They are equipped with "timer knobs" which fan-death-fearing South Korean users can set to 15, 30, 45, 60 minutes and more before going to sleep. Picture taken by Na-Rae Han. This work has been released into the public domain by its author, Megaptera at English Wikipedia. This applies worldwide. 2006-02-20 15:17 Megaptera 480×360×8 (230123 bytes) Close up of fans being sold in a Korean department store. They are equipped with "timer knobs" which fan-death-fearing Korean users can set to 15, 30, 45, 60 minutes and more before going to sleep. Picture taken by myself (Na-Rae Han).